The most iconic monument in Paris, the Tour Eiffel, is lit up every hour on the hour with glittering lights, dazzling tourists and Parisians alike. Amazing that a monument that was originally so unpopular with the locals when it was built over 120 years ago is so famous and beloved today! This is a somewhat aerial view of the Champ De Mars, the large garden that stretches between the Tour Eiffel and École Militaire, full as always of picnickers and tourists. Commissioned in 1806 by Napoleon, the Arc de Triomphe is the biggest arch in the world. Here it is at night, imposing and impressive. For over two centuries, this Parisian museum has been one of the largest and most significant museums in the world. Even after 3-4 hours of exploring, we didn’t see all that the Louvre had to offer. My favorite part of the Louvre was the gigantic paintings with not only beautiful technique but also immense size. 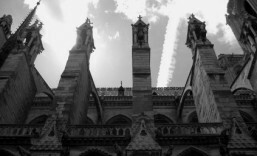 Although we love all of Paris, Notre Dame is most certainly one of our favorite spots. This year, 2013, we were fortunate enough to be present for Notre Dame’s 850th anniversary. Here are the front (or back, I suppose) bell towers on a clear summer day. Ironically, the next time we saw this church, it was raining so hard that our shoes were completely full of water! The gargoyles and chimeras, traditionally designed to scare off evil spirits by their grotesque forms, actually serve to drain rainwater from the towers. There are many beautiful stained glass windows in Notre Dame, but this picture was my favorite. Hopefully you can see even just a little of the detail in the colors and stories depicted here. One of the most beautiful doors in all of Paris is found at Notre Dame, shown here. We love the detail and woodland elf sort of design. On the side street Rue du Cloître Notre Dame, the church looked beautiful as the sun was setting, creating this light spectrum. A woman lights a candle to symbolize her prayer offered up in Notre Dame.